Sage AX is proud to present a new technology that is guaranteed to make your BR programming experience more productive while reducing the potential for errors. By taking advantage of the FileIO style standard file layouts, we're able to produce powerful BR development tools that work out of the box with your existing software, directly interacting with your file layouts to improve your BR experience and cut down on debugging time. Audit BR is a powerful tool, that watches your data files and builds a color coded report showing any changes to your files over a given time period. The report can be sent to a printer, a file, or both. You can view the Documentation for Audit BR on the BR Wiki here. It works like this: The audit.br library contains two functions. The first function makes a backup copy of your data files, into an Audit folder, for comparison later. The second function compares your current data files to a backup that you made previously. When the comparison is run, a full color report is generated showing exactly which records have changed and how they have changed. You can also save the results into a logfile if you like. It can be used to test a new program change. Its especially valuable for testing program changes that modify multiple data files in complicated ways. Simply run the first function (fnBeginAudit) to create or update the backup copy of your data files. This creates the "Begin Point" for the compare. Then run your new code. After testing, run the second function (fnCompare) and view the changes in your data files. Check to make sure the files changed in the appropriate ways. It can also be configured to run regularly and used to monitor changes made by the end users using your software. 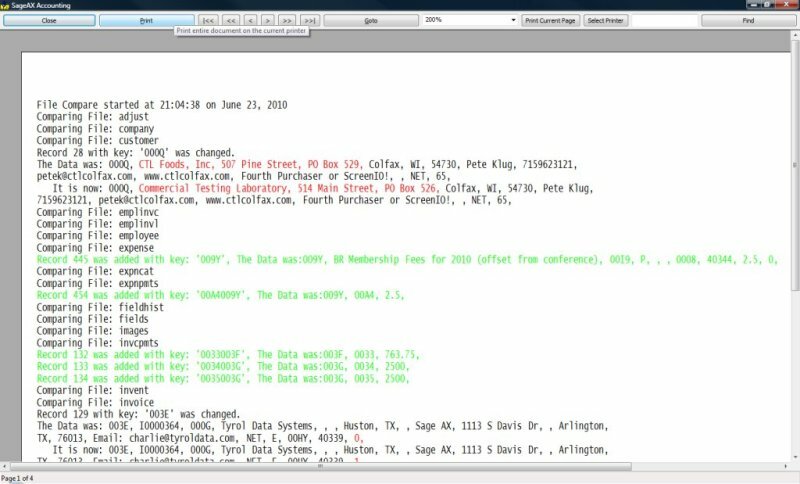 By specifying a logfile and running the process on a regular interval, you'll create an audit trail logfile, showing exactly which changes were made and at what times those changes were made. And if you regularly review this logfile, you can discover signs of trouble before they become serious. In my system I have many different types of records. If I delete an Employee Invoice, I have to delete the Expense its tied to. I also have to delete all the invoice lines for the invoice. For each invoice line I have to check and see which timelogs it comes from and those timelog entries have to be marked "Open" again, sinse they're no longer on the invoice. When I implemented the code that made sure all that happened, it was in a series of functions spread across different libraries. I had a library for expenses and another library for employee invoices, and the changes were so complicated that testing was going to be a nightmare. But with Audit BR, testing was a cinch. I was able to run the Audit Report and see exactly which data files were changed and exactly in what ways they were changed. I found a couple bugs that I might not have discovered until months later, saving myself countless expense, time and headache. And I was able to complete the testing and move forward with the confidence of knowing my code was working properly. Thats why I want to share this tool with everyone in the BR community. Audit BR is now 100% Free! You can download Audit BR here.